Carbon Monoxide and Methane are odorless, colorless gasses that threaten the safety of workers in many industries. Protect them with these inexpensive detectors. 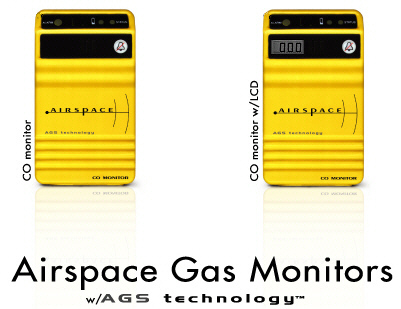 Airspace gas monitor models, options, and accessories tailored to meet your particular needs. Lifetime Warranty - on "sniffer" models, includes sensor. 5 Year on all others. Reliable AGS Technology TM - consistent solid-state sensor performance. Low maintenance - no routine calibration or sensor replacement. Easy to use - simple on/off with single alarm silence button. Cost effective - low cost of ownership. Lightweight, rugged design - weighs just 4.8 oz. with batteries! Portable - shirt-pocket size measures just 3.9 x 2.3 x 0.9 inch! Certified intrinsically safe - approved by Underwriter's Laboratory, Inc. for use in Class 1, Division 1, Groups A, B, C, and D environments. Low battery warning - battery low and battery dead indication. Audible and visual alarm indicators - alarms at CO levels of 30, 60, 120 ppm and CH4 level at 5000ppm. Vibrating alarm indicator option - alerts user to danger even in noisy environments. CO only and CO with Methane versions available - more functionality for little added cost.